US #790 pictures Barry and ship the Lexington. 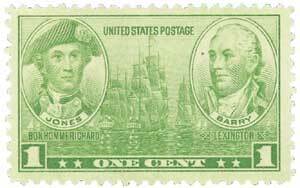 Naval officer John Barry was born on March 25, 1745, in Tacumshane, Ireland. When Barry was a child, his family was evicted from their home and moved to Rosslare on the coast of Ireland. There Barry’s uncle worked on a fishing skiff and he discovered his love of the sea and decided he would spend his life on the water, with his first job being a ship’s cabin boy. US #1072 was issued for Mellon’s 100th birthday. 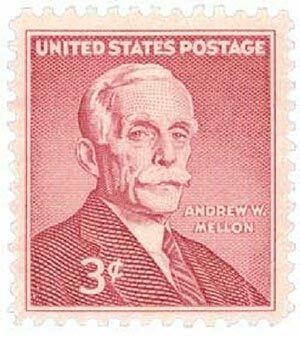 Andrew William Mellon was born on March 24, 1855, in Pittsburgh, Pennsylvania. The son of a successful banker and judge, Mellon attended the Western University of Pennsylvania but left before finishing his degree. Mellon’s father recognized his son’s financial abilities at an early age and helped him establish a lumber and coal business. Before long, the younger Mellon made it profitable and he was soon invited to join his father’s banking firm, T. Mellon & Sons. US #3314 pictures Franklinia, which Bartram discovered with his son. 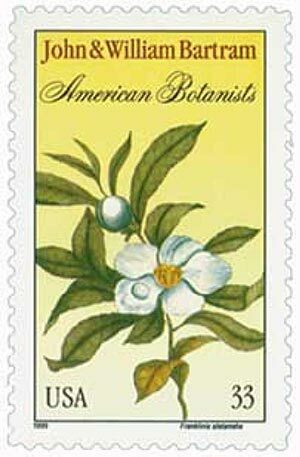 Botanist John Bartram was born on March 23, 1699, in Darby, Pennsylvania Colony. Born into a Quaker farm family, Bartram had little formal education, aside from attending a small local school. From a young age, he had an interest in medicine and medicinal plants. US #1009 was issued for the 50th anniversary of Federal assistance in the West managing the resources of local rivers and streams. 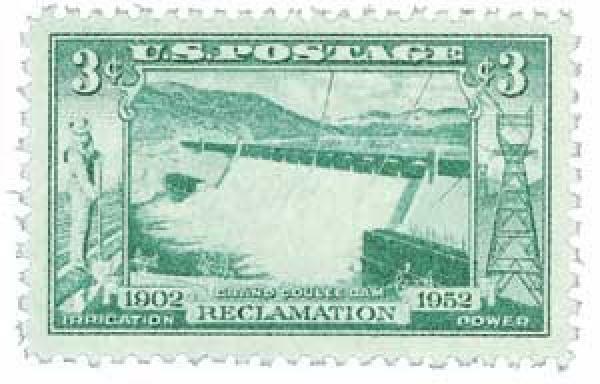 On March 22, 1941, the Grand Coulee Dam first began producing power. The Grand Coulee is a very old riverbed on the Columbia Plateau. As early as 1892, there were discussions of a possible plan to build a 1,000-foot dam across the Columbia River. However, that would have meant a reservoir would extend into Canada, which violated treaties. 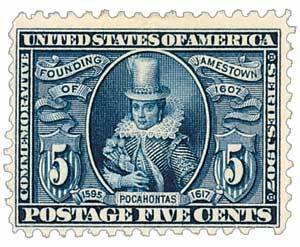 US #330 was based on a 1616 engraving of Pocahontas. On March 21, 1617, the funeral of Pocahontas was held at Saint George’s, Gravesend, Kent, England. The exact date and year of Pocahontas’ birth are unknown, but historians estimate it to have been around 1596. She was the daughter of Chief Powhatan, the chief of an alliance of about 30 Algonquin groups in Tidewater Virginia. 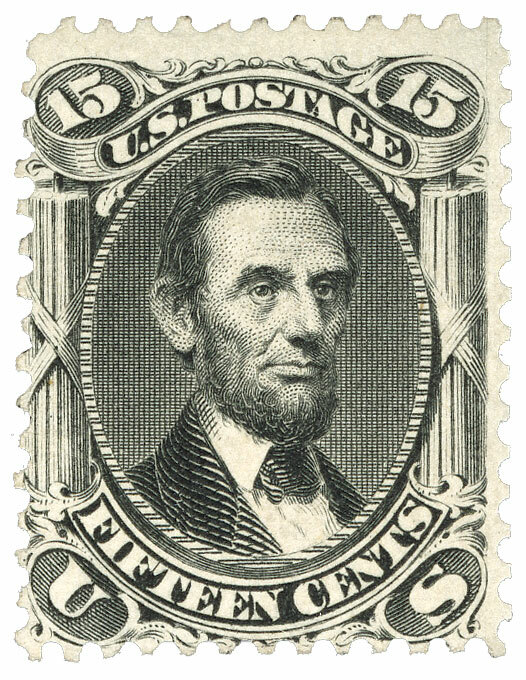 US #77 – The Lincoln mourning stamp. On March 20, 1865, John Wilkes Booth planned to kidnap President Abraham Lincoln. After Lincoln was elected in 1860, he began to receive many threats on his life. Though there were a few attempts, he never took the threats seriously.